PRODUCTS CONTAINING CANNABIDIOL (CBD), a cannabis-based ingredient, used for medical purposes are to be officially classed as medicines in the UK. The Medicines and Healthcare products Regulatory Agency (MHRA) said medicinal products must have a product licence “before they can be legally sold, supplied or advertised in the UK, unless exempt”. Licensed medicinal products “have to meet safety, quality and efficacy standards to protect public health”, it added. The MHRA said people who use CBD should speak to their GP or another healthcare professional if they have any questions about the issue. In a statement, the body said it has “written to UK CBD stockists and manufacturers to inform them of our view”. “We can provide regulatory guidance to any company who may wish to apply for a licence,” it added. Heddel said a review of the evidence showed “it was clear that people are using this product with the understandable belief that it will actually help”. A bill that would regulate cannabis for medical use in Ireland was passed in the Dáil a few weeks ago. The Cannabis for Medicinal Use Regulation Bill has several stages of legislative scrutiny to go before medicinal cannabis is available here. While some forms of CBD are available to purchase in Ireland, they are not regulated as a medicine and cannot be prescribed by a doctor. 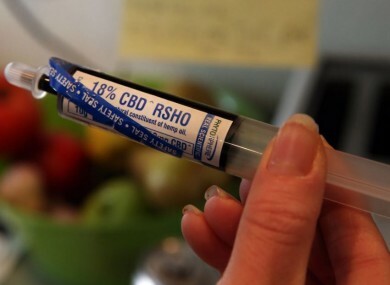 CBD oil is generally low in THC, the psychoactive ingredient in cannabis that makes people high. In November, the Oireachtas Health Committee heard evidence from the mother of an epilepsy sufferer who spoke about how treatment with cannabis-based products had reduced her daughter’s seizures dramatically. Vera Twomey’s daughter Ava has a rare form of epilepsy called Dravet syndrome. Her family turned to Charlotte’s Web, described as a purer form of cannabis oil with high levels of CBD. Email “Cannabis ingredient to be classed as medicine in UK ”. Feedback on “Cannabis ingredient to be classed as medicine in UK ”.